Cirque du Soleil unveiled today a sneak peek of Crystal, its very first show fusing circus arts and the world of ice. For the occasion, a preview of this 42nd production was presented with a group number mixing acrobatic disciplines and skating figures, a high-octane romp on ramps where extreme skaters perform crazy flips and jumps at breakneck speed as well as a poetic pas de deux on aerial straps that completely blurs the boundary between ice and sky. 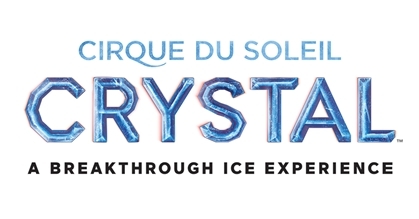 Crystal is the first-ever experience on ice from Cirque du Soleil. World-class ice skaters and acrobats take their new frozen playground by storm with speed and fluidity as they challenge the laws of gravity with a flurry of unexpected acrobatics. A new kind of performance as Cirque du Soleil meets the ice. Crystal, the show’s main character, sets out on an exhilarating quest to fulfill her destiny as she dives into a world of her own imagination. She soars through this surreal world at high speed to become what she was always destined to be: confident, freed, empowered. Crystal is about looking at things from fresh angles, peeking through the veneer of everyday life, reframing one’s daily reality to see what one might have missed. Sometimes the only way to appreciate things is to look at them sideways. Discovering one’s individuality and uniqueness requires venturing out on thin ice. “Crystal breaks the codes of the traditional ice show by creating a unique form of entertainment. To reach this objective, we brought together the best experts in their respective worlds. With this new show, the audience will discover the infinite possibilities that ice adds to the prowess of circus arts,” says Daniel Fortin, Executive Director, Creation, Crystal. Kurt Browning is the Senior Skating Performances Designer for the show CRYSTAL. He is a four-time Canadian figure skating champion and a four-time World champion. He competed at three Winter Olympic Games, 1988, 1992, and 1994 and carried the Canadian flag during the ceremonies in 1994. Professionally, Kurt has accomplished a lot including three Canadian Professional Championships and three World Professional Championships. On March 25, 1988, at the 1988 World Championships in Budapest, Browning landed the very first quadruple jump in history. This accomplishment was recorded in the Guinness Book of World Records. Benjamin Agosto is the Skating Performances Designer for CRYSTAL. Benjamin Agosto is a five-time U.S. ice dancing champion and 2006 Olympic silver medallist. With partner Tanith Belbin, Agosto is the 2006 Olympic silver medalist, a four-time World medalist, the 2004–2006 Four Continents champion, and 2004–2008 U.S. champion. Marilyn Langlois is the Synchronized Skating Designer for CRYSTAL. A graduate of the Institut national du sport du Québec and a former singles and synchronized skater, 2003 World Synchronized Skating Championships silver medalist Marilyn Langlois is the first figure skating coach from Quebec to obtain Level-5 certification from the National Coaching Certification Program (NCCP). Tickets for performances of CRYSTAL are available online at www.cirquedusoleil.com/crystal. Sun Life Global Investments is the presenting sponsor of Crystal in Canada.